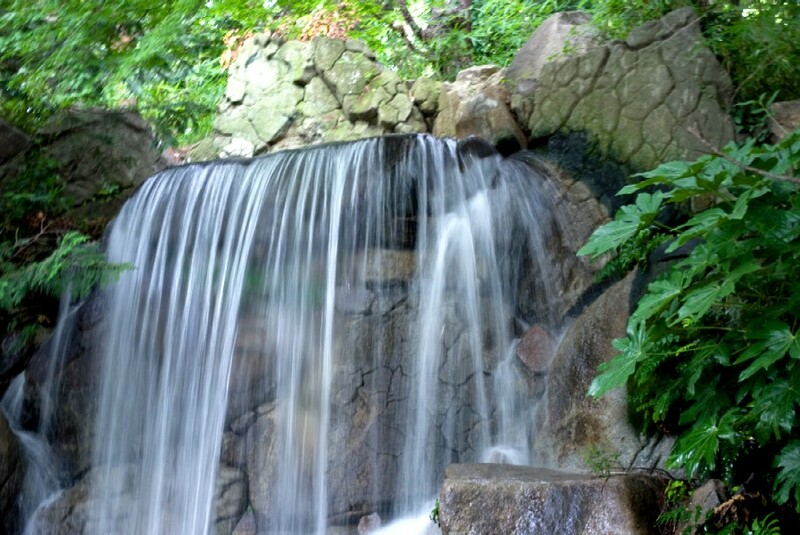 Hot humid weather continues in Tokyo. Shochuu-mimai (暑中見舞い) is a postcard for a summer greeting sent from the end of the rainy season until the beginning of fall (立秋) according to the calendar. The cards often have a picture of a scenery and thing of summer, and some make a recipient find pleasant cooling sensation. 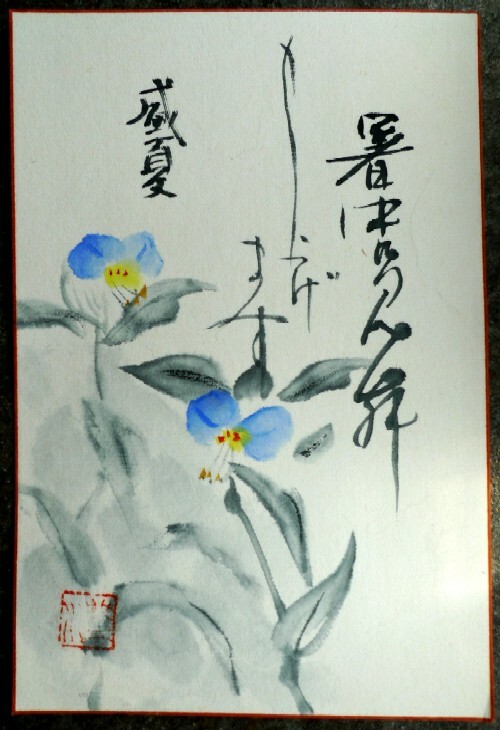 I received this handwritten post card yesterday from my aunt who is teaching Japanese-style painting. These days fewer people are exchanging Shochuu-mimai, and I haven’t sent it during the past decade. 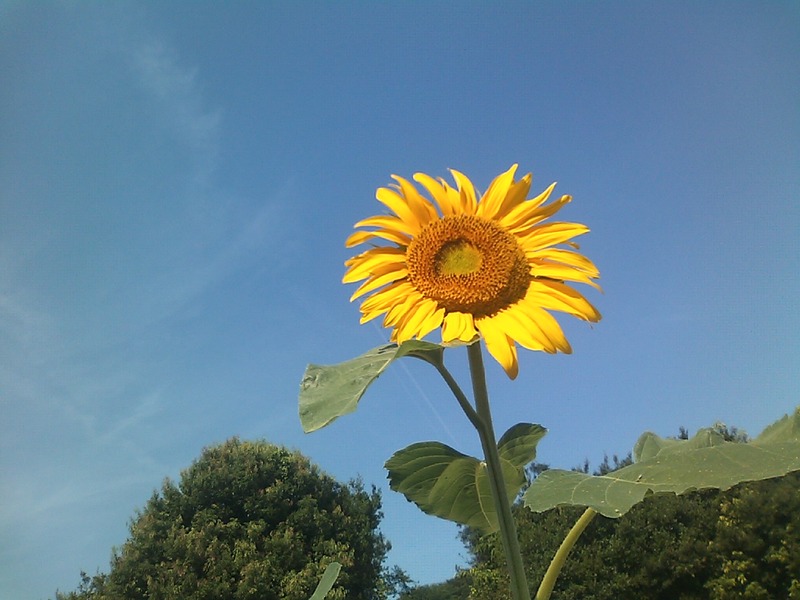 However, I revalue the meaning of it because I feel summer in Japan is really life threatening now. In Japanese, "Shochuu (暑中)" refers to “during the summer heat”, and “mimai (見舞い)” means “visitation” or “a get-well card.” That shows people tended to be ill because of the summer heat as of old. In recent years, we must look after our bodies seriously. By the way, I realized something with Shochuu-mimai as a start, and I want to detail about that in the next post. 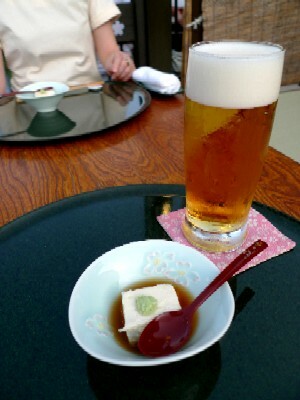 Kinakinw, visiting Kyoto annually, can’t follow bar trend. 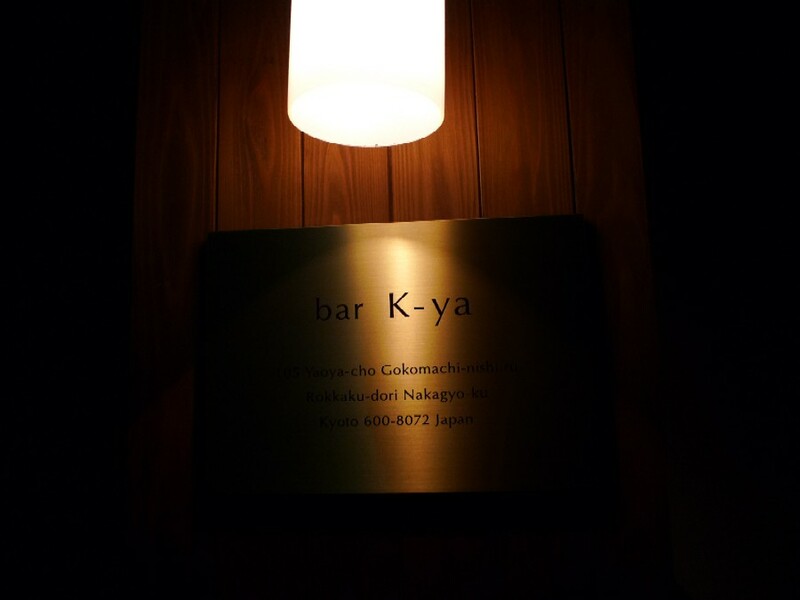 I surfed the net and picked a bar, K-ya (K家). It was the right choice! 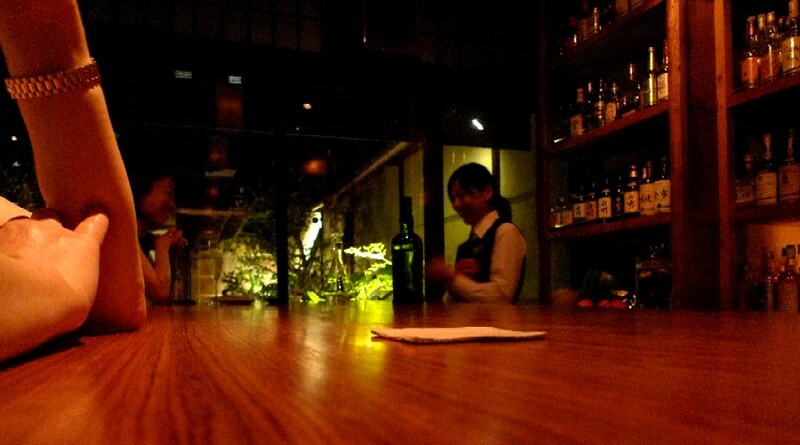 The authentic bar with great machiya (町屋: traditional wooden townhouse in Kyoto) interior and design is stylish and receives media exposure, but the greatest value of it is Mr. Junichi Kurono (黒野純一), an owner bartender. 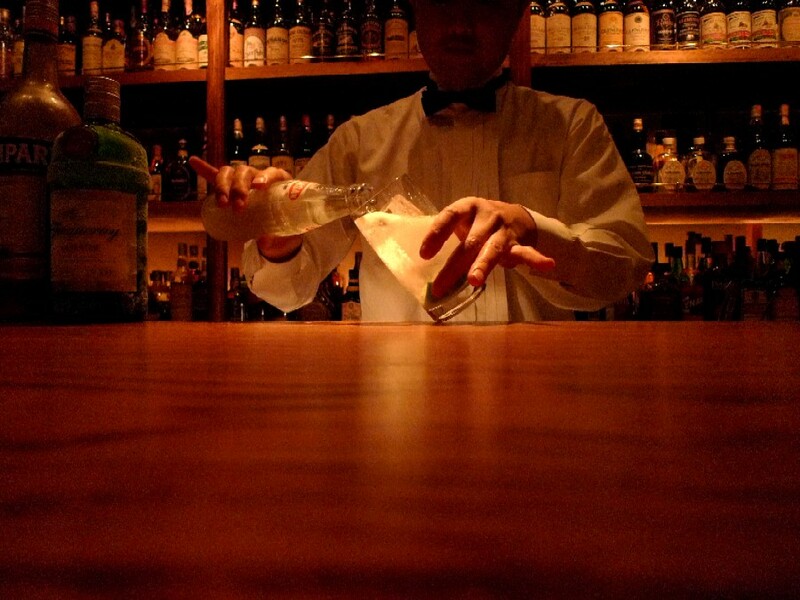 The movements of the skillful and orthodox bartender were so graceful and eye-filling. The backbar was a spectacular view. The bar has a wide range of single malts. The picture above shows only half of the shelf. 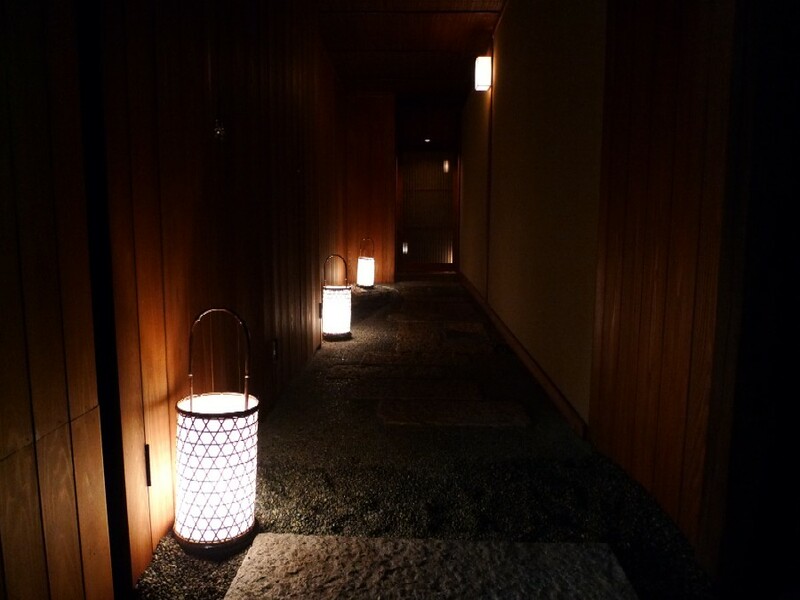 I’m going to stop for a drink at Mr. Kurono’s place again and have cocktails when I visit Kyoto. Kinakinw is never too busy to stop in Kyoto. I went to Osaka to see an event that would help with job at my own expense. The event finished at noon. 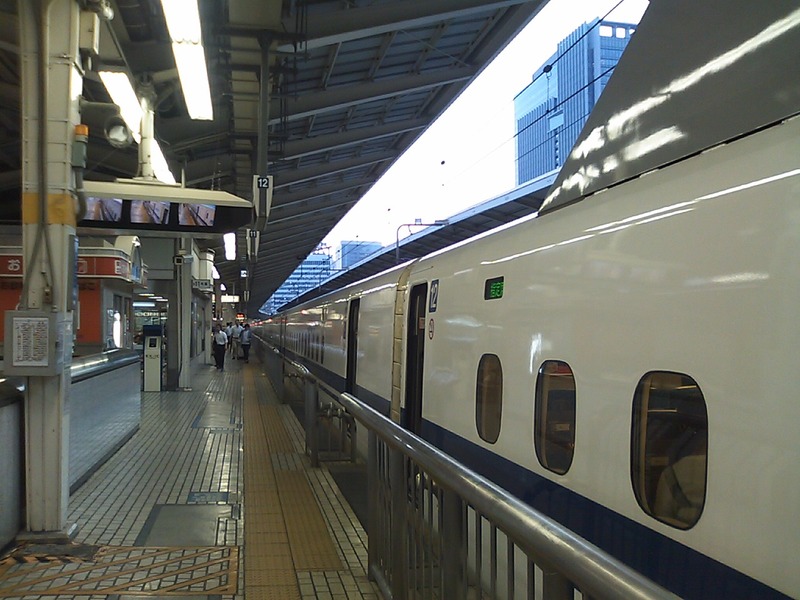 I righteously joined my friend at Osaka station, and we took a train for Kyoto. I dined at a Japanese restaurant, “Sakura (櫻)” in Kiyamachi (木屋町), west bank of Kamo River between Shijo (fourth) Street and Sanjo (third) Street. An acquaintance took me this restaurant last summer, and I thought it was great spot for dining because of a great view, delicious dishes and kind hospitality of the staffs. 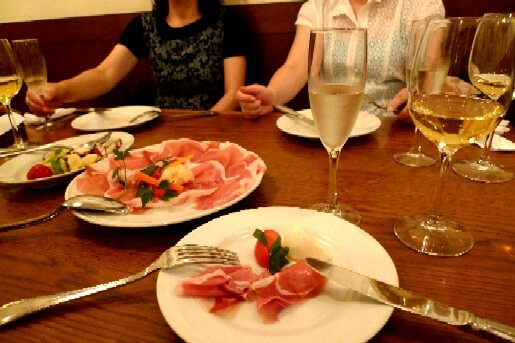 One of other reasons was that the restaurant didn’t cram too many people in the Kawayuka space. 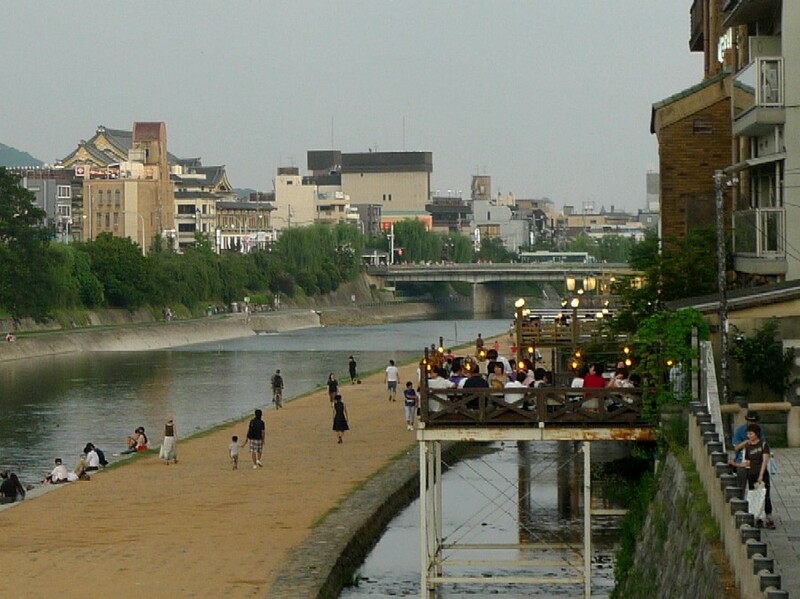 I don’t want to dine on Kawayuka decks packed with people. 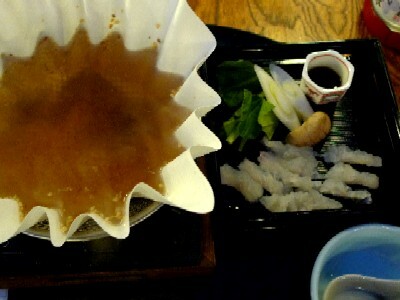 It was the real joy of Japanese food. This plate looked refreshingly cool. The sun was setting while we were enjoying the meals. 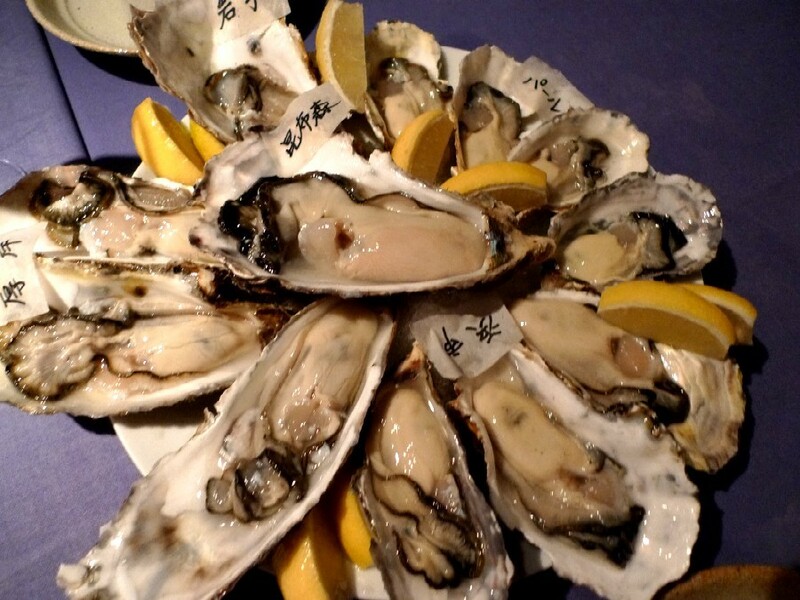 ※ You'd better make a reservation ahead of time. Kawayuka dining is really popular. It's cooler than the inner city area. I got off work an hour ago and headed off to Tokyo station. I'm going to Osaka for a business trip by Shinkansen bullet train. Will I be any good this time? 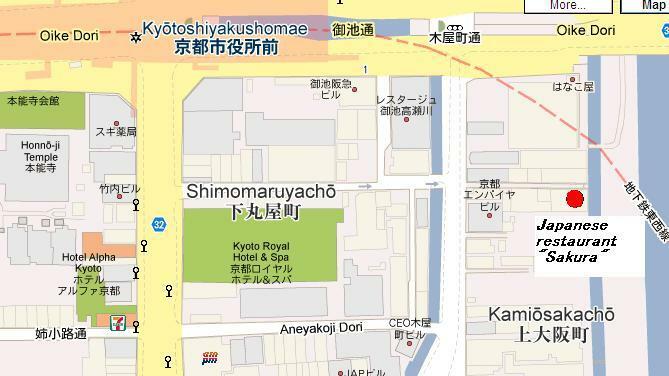 I was asked to lead college students and walk around Ginza (銀座: a shopping and entertainment town) and Shinbashi (新橋: a town located south of Ginza). I conducted the after-school program this evening. The urban environment is in some way related to my research theme. I explained to them several sections of the towns distinguished by some identity or character. 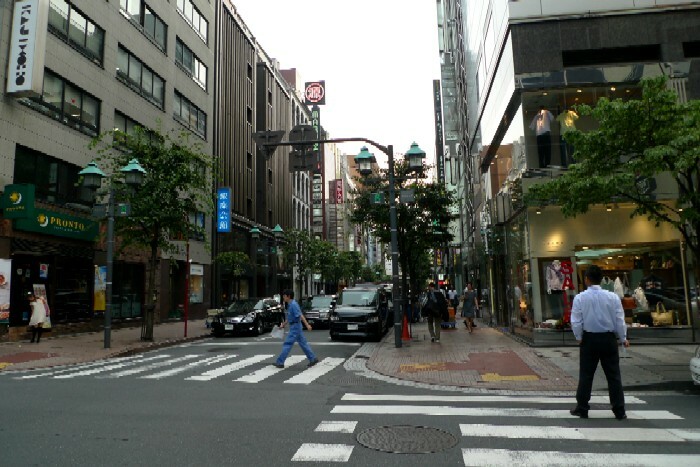 In the case of Ginza, the sections are characterized by type of stores, eating and drinking establishments, and business. It’s interesting to examine sections and their boundaries. Shinbashi has the common touch. After the stroll, we shared a snack on a professor who sent the students at a top-floor restaurant in a hotel. 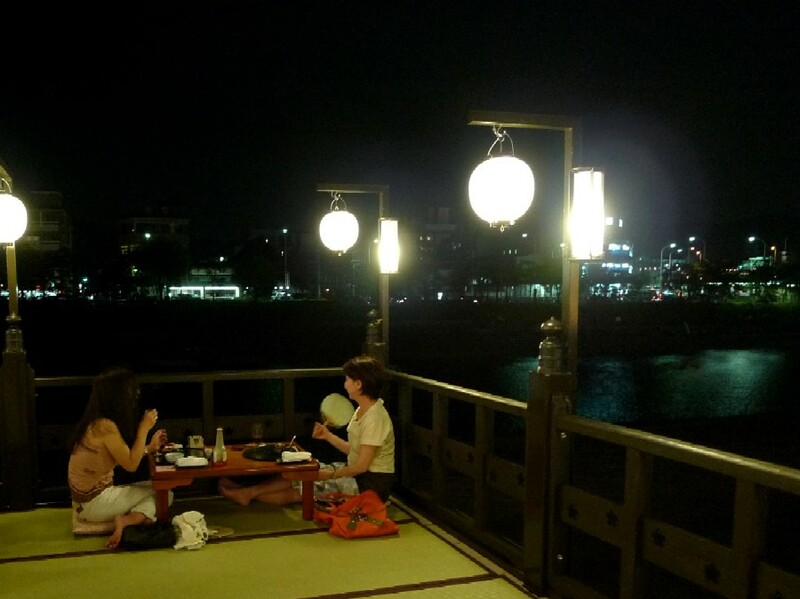 I chose the restaurant NOT because I wanted to have drinks while looking at the beautiful night view. Viewing the towns from above is a part of study of town observation. 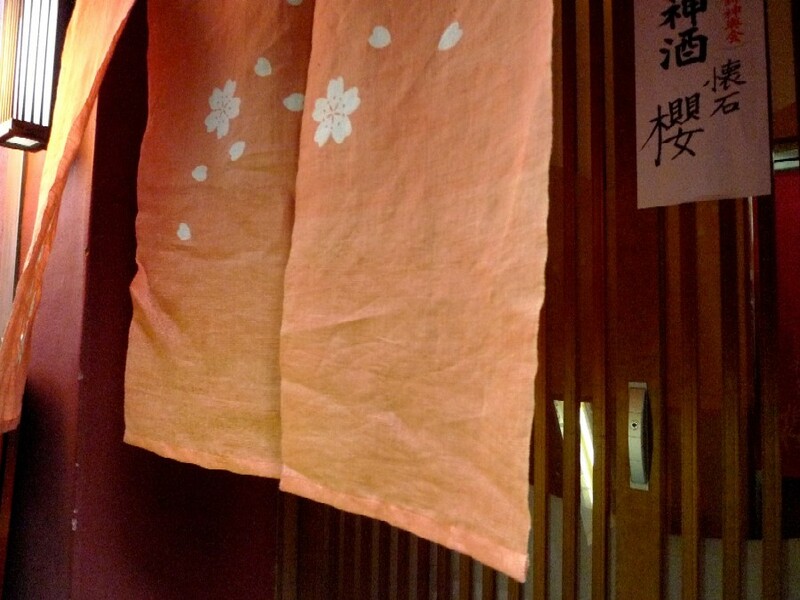 The rainy season was over, and the wind bells (風鈴, Furin or Fuurin) marked the beginning of summer in my neighborhood. For several years, these wind-chimes made of glass are set up around the entrance of a temple nearby at this time of year. As an aside, a chief priest of the temple is a friend from childhood. Oh…. Though a former chief priest, his father, passed away young, my classmate in elementary school is old enough to be a chief priest! 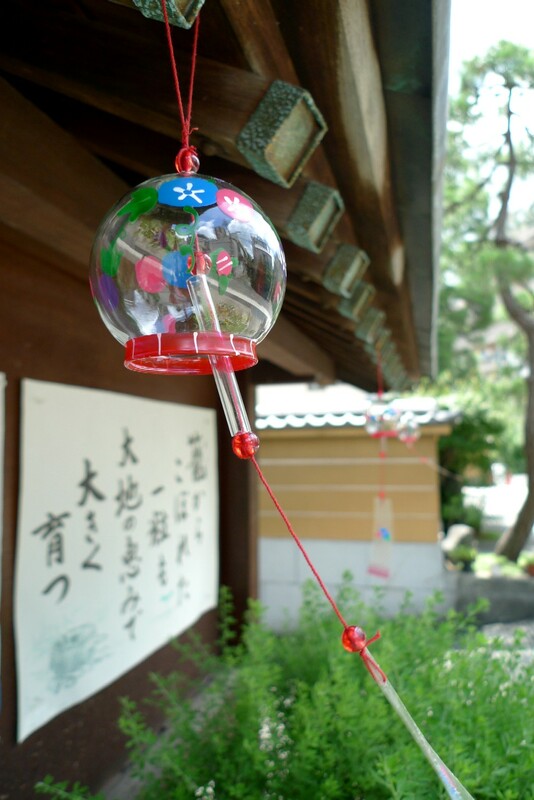 This type of wind bell is called Edo Furin (江戸風鈴). Japanese glass-working was developed in Ngasaki which was the only city to maintain international trade throughout Japan's period of isolation. The glass-making technique was introduced into the Edo town (old Tokyo) in the mid Edo period (1603-1868), and then by the end of it, the glass wind-bells became popular among common people. 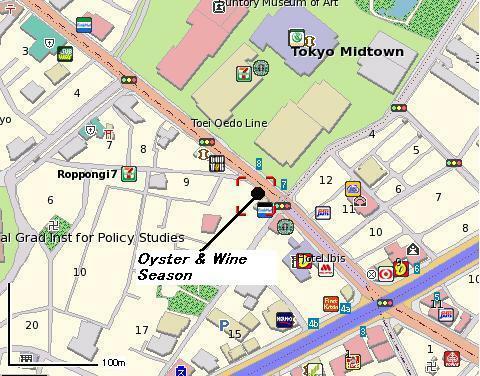 Their refreshingly cool sounds are still heard at corner of the modern Edo. However, it has been difficult that we feel coolness only by the wind-bells. Just for information, today's maximum temperature in Bali is 27 (80.6). A famous Japanese theater director exposed his ignorance on TV few days ago. Taking mobile phone charms (or straps, 携帯ストラップ) for example, Mr. Noda asserted that more Japanese are acting in a childish manner. This is my sister’s mobile phone. At the beginning of diffusion of cell-phones in Japan, most of the charms were simple lanyards to help users hold their phone. 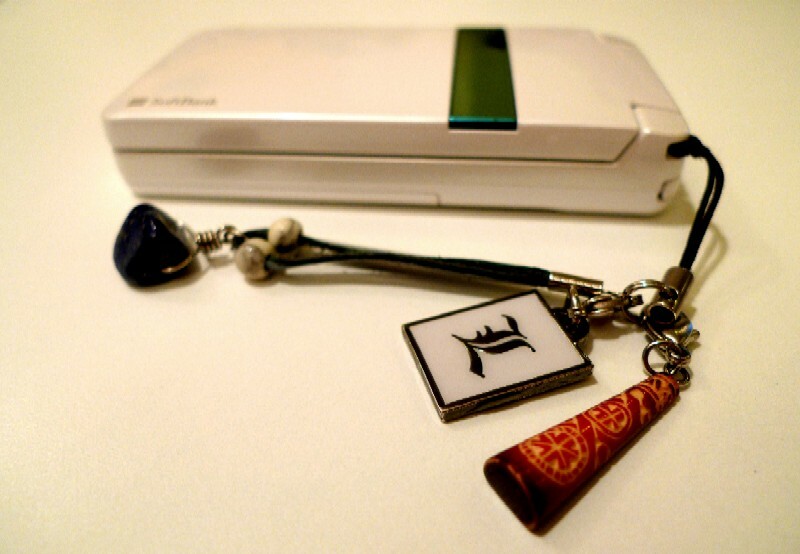 However, now many people personalize their mobile phones with variety of charms. I understand that the charm is a contemporary version of netsuke (根付) that was developed in Japan during the Edo period (1603-1868). 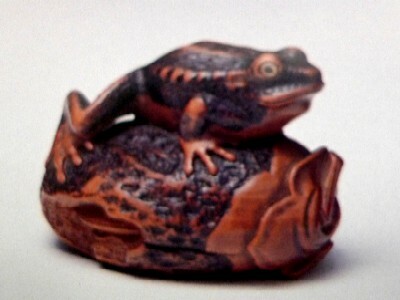 It seems that netsuke can be defined in two ways: as antique art and commodities. According to International Netsuke Society, a netsuke is a form of miniature sculpture served both functional and aesthetic purposes. A small toggle called netsuke was attached to a cord to stop it from slipping when men suspended a pouch from kimono sash. 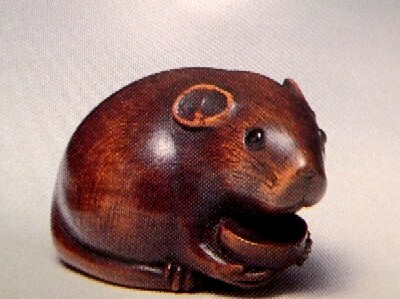 Netsuke often beautifully decorated with elaborate carving, lacquer work, or inlays of rare and exotic material (e.g. wood, ivory, precious metals, shell, coral, and semi-precious stones). There are many keen collectors all over the world, and items made by master craftsmen in the Edo period are traded at a really high price. 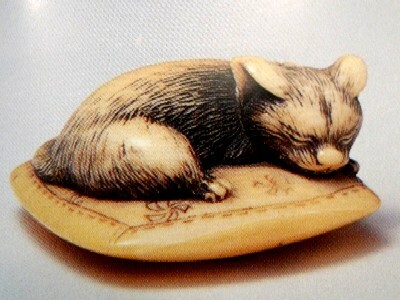 In modern Japan, a charm or a little figure attached to a cord is also called netsuke, and it has been a product familiar with the public from long, long before mobile phones were developed. 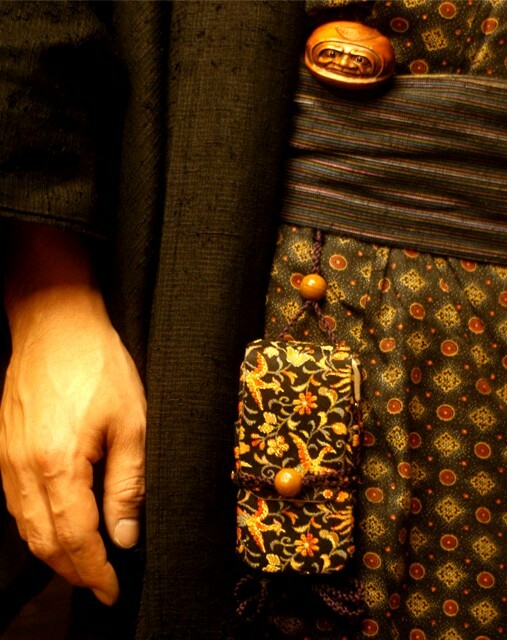 For many Japanese who has a netsuke culture, it’s natural to attach it to a purse or a wallet now and forever. It's hard for Japanese to miss the mobile phone’s hole that is convenient for attaching it. A netsuke collector, Shingo Ymaguchi (山口真吾) takes a same view with me that dolls and figures of phone charms have originated as netsuke in the Edo period. 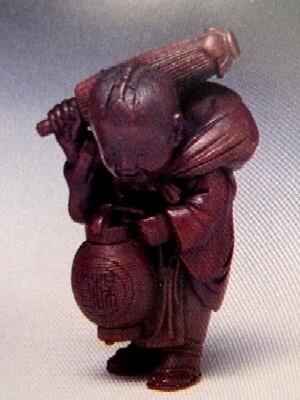 Indeed, a phone charm is often called “a netsuke strap.” Some people use traditional netsuke as phone charms. Look at the wonderful antique netsuke collection. They are only 2 - 4 centimeters tall. 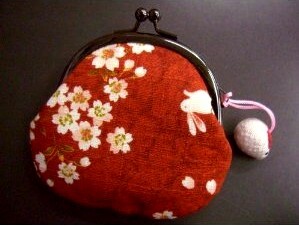 In the Edo period, men used the pouch with netsuke. Some of them look too lovely for men, but it was a sense of fun with style. Some people who don’t know our culture might find it intriguing that men and women of all ages use phone charms and say, ‘How strange!’ The others might make a wrong assumption that the charms show Japanese juvenility. Kinakinw gets fed up with the simple Japanese who follow the irrelevant accusation blindly. Where do you head to when you need a chandelier? 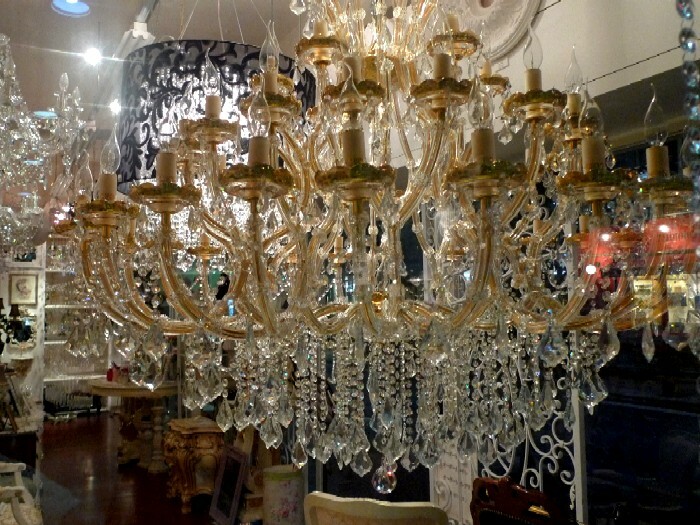 I’m lucky enough that there are three chandelier shops within walking distance of my home in Azabu. I'm just joking. I don’t have any room in which I can hang a brilliant chandelier from the ceiling. There used to be an authentic Chinese restaurant where this new chandelier shop stands. It was a pity that the restaurant, serving good “tantan-men (担担麺, hot sesame noodles), closed. However, I got it into my head that a new restaurant would open and was looking forward to it. Then I passed by that place the other day and found out the third chandelier shop opened. I was a little disappointed about the shop because, firstly, it wasn’t a restaurant. Secondly, items besides chandeliers, for example, imported furniture and interior goods, were neither sophisticated nor stylish for me. The items in the shop reminded me of an air of vulgar prosperity that was a style of a decade ago. But I take a passing interest in chandeliers it offers. Unlike the other two shops that select only fancy chandeliers, it has a wide range of them from European luxury brands to reasonable items. I didn’t know that I could buy a well-looking chandelier, to my untrained eye, for 30,000yen ($300) or less. Though I'm not thinking about getting one, I’m going to the shop and check out them in the course of time. This is just an aside. 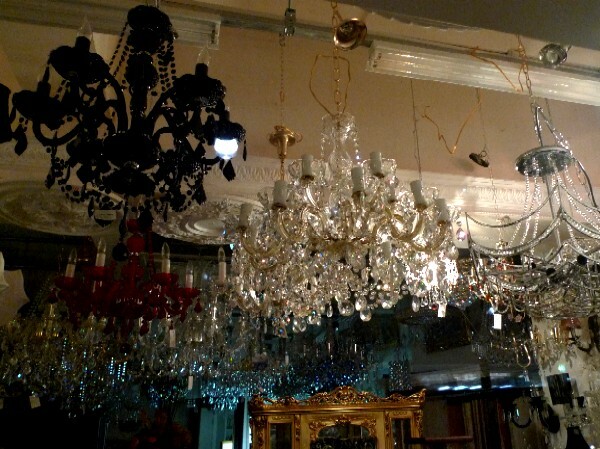 Chandeliers are displayed under normal fluorescent lamps in the shop. I’m in time for fresh green peas in season! In Japan, fresh green peas come into season from March to June. I usually make “green peas rice (豆ご飯) ” when I find them at the store shelves in spring, but I did not until yesterday this year. I was lucky to get them. 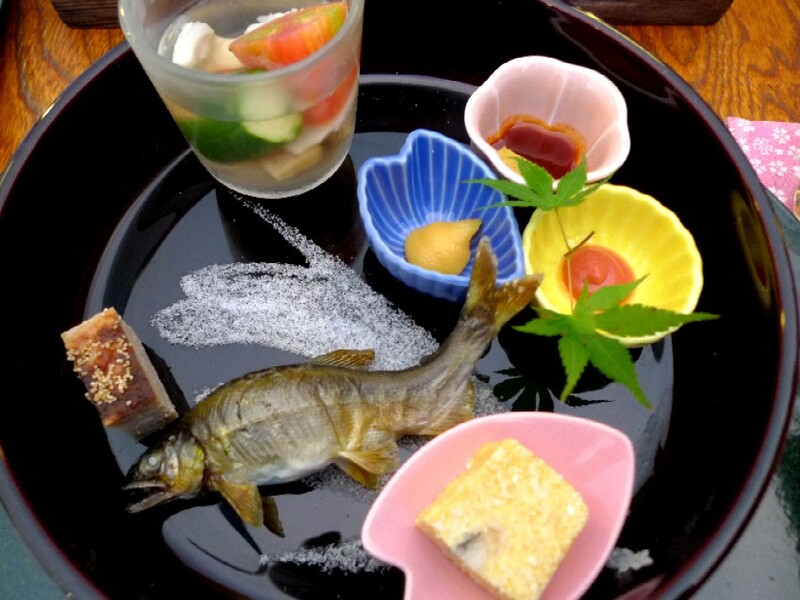 Though Japanese cuisine such as Sushi, Tempura and Sukiyaki is gaining popularity worldwide, I'm afraid our home-style cooking is relatively unknown. 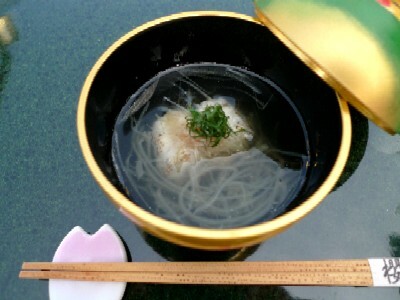 The dish is often called just “takikomi-gohan (炊き込みご飯) ” that is a collective term for rice cooked with “dashi (出汁: soup stock)” along with vegetables, meat, or fish. Takikomi-gohan is one of popular home-style dishes. Some kinds of takikomi-gohan that are seasoned with soy-sauce-based soup are stronger-tasting than green peas rice. 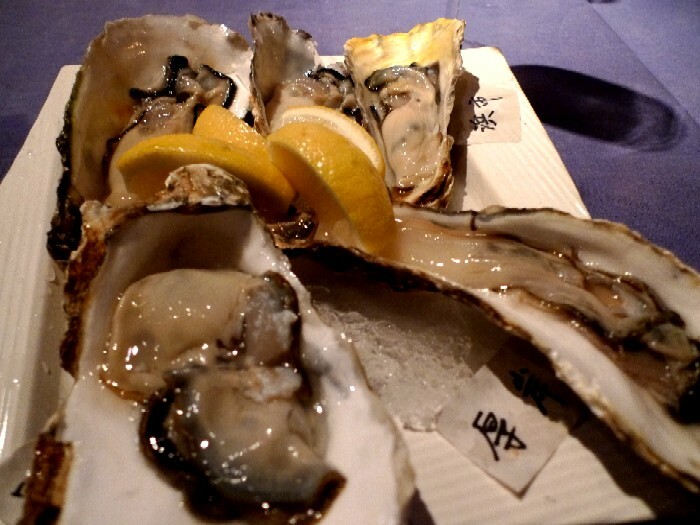 However, it has a rich flavor. So, why don’t you stretch out with your taste sensation and try it, if you get fresh green peas. Cooking it is rather simple. Ingredient: washed rice, green peas, some rice wine (or white wine), touch of salt and a piece of dried kelp (or instant bouillon). First, put rice and rice wine in a rice cooker and then add water (appropriate quantities for the rice). Put the rest of ingredients and switch on the cooker! *If you don’t have a rice cooker, cook it the way you usually do. However, the total amount of liquid should be about 10-20% more than the amount of rice. 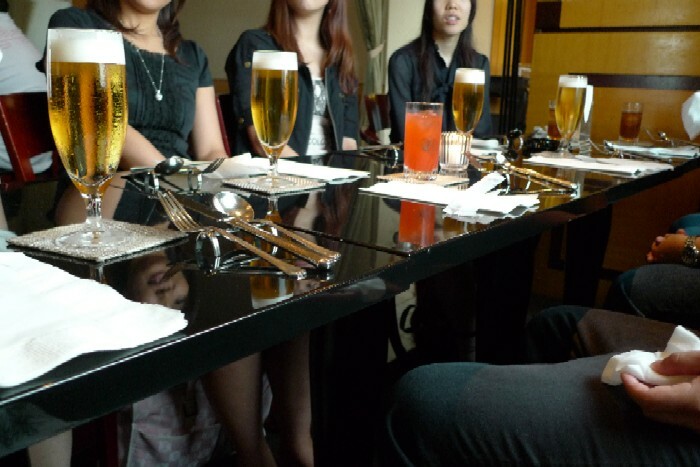 I went to a restaurant with my soccer-watching friends yesterday, and we raised a toast to the Japanese national soccer team. In 1997, we had a dinner to celebrate the team’s win in the final Asian qualifiers for the World Cup in France. We had not got together on the theme of soccer since then. It seems like only yesterday that we had the dinner, but it was thirteen years ago. Each member had changes in life during that period. One of them switched companies. He had an elementary school boy and kindergarten girl. Now his son is a college student, and his daughter is in high school. One of the others is a mother of a seven-year old son. Her son who joins a soccer team watches this World Cup games intently. She said that he knows more about players than she does. The other started a vast range of activities besides working. Come to think of it, it's been a long thirteen years. There have been many ups and downs. I’ve been stuck in the similar job but broke into a new business field nine years ago, and I work in a very different setting. I couldn’t imagine my present self in 1997. How did your life go during the past thirteen years? Originally, the word “critical period (臨界期)” was used in Ethology, study of animal behavior, in 1960’s. It means the period when imprinting is observed in certain species, for example young birds. Typical form of imprinting is that newly hatched chicks follow the moving object they see first. The concept of the critical period was applied to the human (first) language acquisition. You may think of second language acquisition when you hear the word. Some people casually refer to the period like this: unless one learns foreign language before 9 years old, one never speaks it fluently. However, it seems that critical period effects in second language learning is less widely accepted in linguistics. 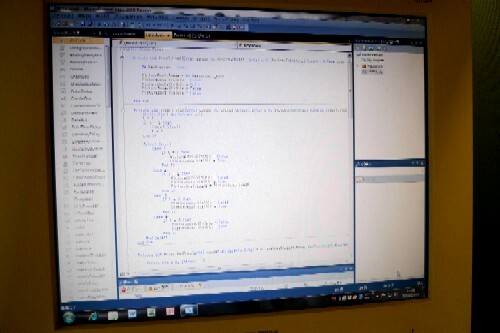 I’m writing the program by trial and error in front of the screen. The past few weeks, I’ve been dealing with producing a program that I’m going to use sometime after the autumn. I made a simple program few years ago, but I’m a complete beginner. Eventually, I finished the basic parts yesterday, and at the same time, I found a major defect in it. My burden is far from over. I usually love to learn new things, and I hope the programming will bring me much joy though I’m well past the critical period. Today, I ice-skated after a long, long interval. Nice to meet you. This is Kinakinw. 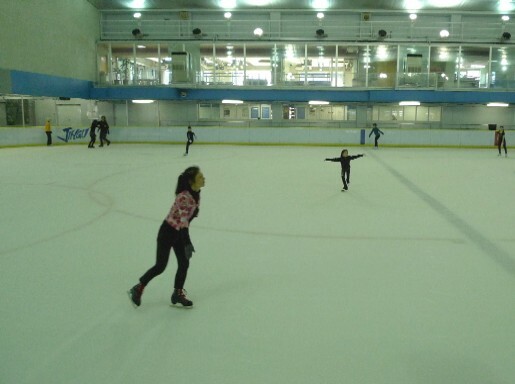 When I first looked over an ice rink, in the early afternoon on a weekday, I faltered because all I saw were skilled skaters who were training. Then, I felt insecure about my ability to skate. It’s considered that the human memory can be classified into two categories. One is declarative memory consisting of semantic (meanings) and episodic (times, places) memory, and the other is procedural memory. The procedural memory is sort of like riding a bicycle. If you forget a meaning of a foreign word you rarely use, you never forget once you know how to ride it. Skating is also thought typical procedural memory. There were more recreational skaters over time, so my sister and I practiced spins and skating backwards discreetly in a corner of the rink. I lost my edge but enjoyed few hours on the ice among future Mao and Daisuke. I have half a mind to take skating classes to improve skills. The bamboo branches decorated with streamers and strips of paper are “Tanabata festival (七夕, Star Festival)” decoration in my office. It’s a little unglamorous. July 7th of the lunar calendar is the day of Tanabata. In general, we celebrate the season festival based on the new calendar, while it’s held on August 7th after the rainy season in many cities in the northern area of Japan. The origin of the festival is considered old-time Chinese tradition in which women prayed that they would improve handicraft skills. The tradition was based on the legend, like Greek mythology. ‘There was a girl (Vega, Lyra) who was good at weaving. After she married a cowherd (Altair, Aquila), she neglected her weaving, so the god put the Milky Way between them. The only chance they have to see each other is on the night of July 7th’. 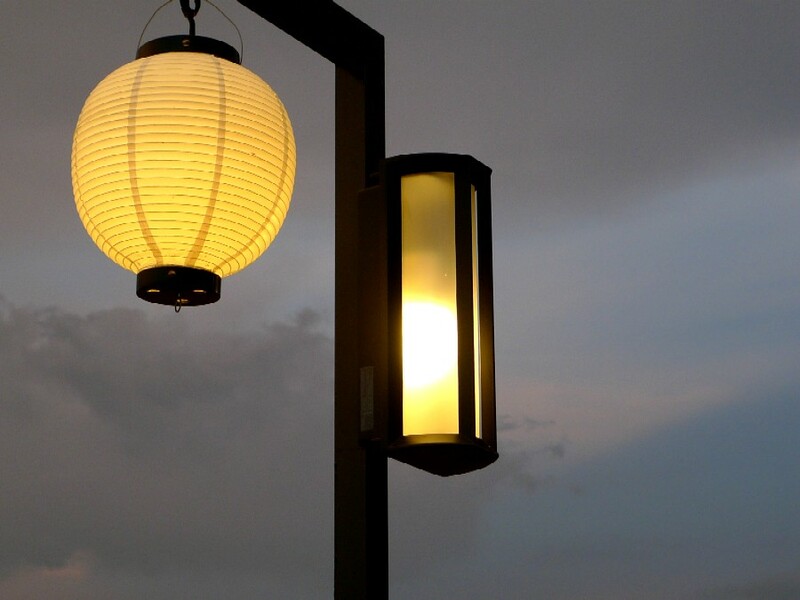 The tradition was introduced into Japan in the 8th century and was incorporated into Obon (お盆), Japanese Buddhist festival to recognize ancestral spirits. 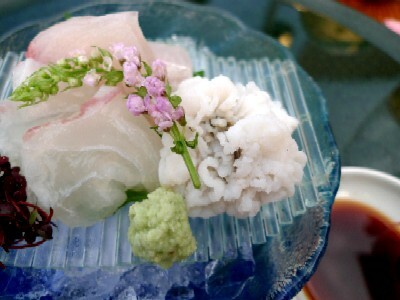 It became popular among ordinary people in the Edo Period (1603-1868). 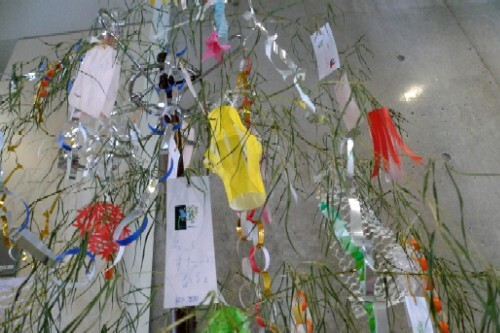 On the day, people write their wishes on strips of paper and hang them from bamboo branches. When I was a child, I loved to decorate bamboo branches, but I forgot what I wished. Yesterday, I read the strips young staffs wrote. I introduce their nonsense wishes. 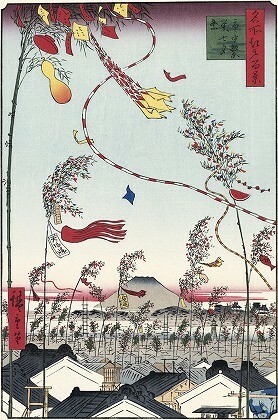 Hiroshige (1797-1858), a famous ukiyoe artist, depicted the festival. Many shopping streets adopt the festival as an effective event for drawing spectators. Are You All Right without a Parasol? Different people have different customs. 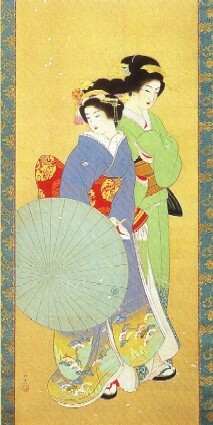 A Higasa (日傘, a parasol) is one of typical examples. 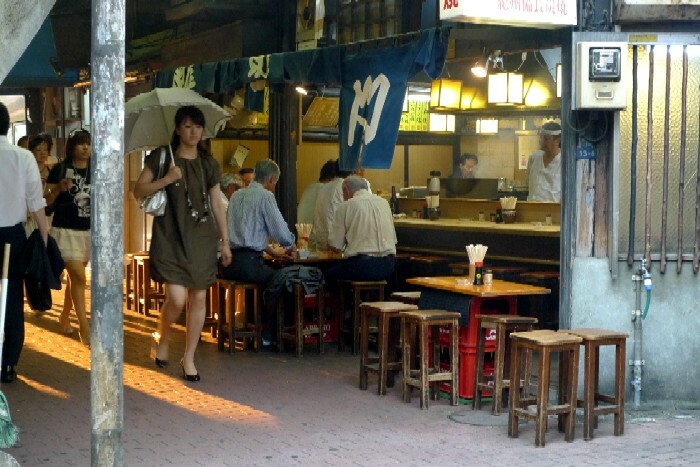 From the beginning of summer, many Japanese women use a parasol to shield them from UV light. 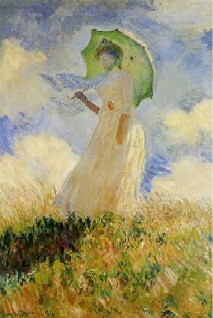 In contrast, those in Western countries, in which a parasol was used some time ago, seem to lack sufficient attention to sunlight though it’s too obvious that UV light causes the long-term damage to the structure of the skin. I got a perfect tan in my teenage years but quit tanning because of the appearance-damaging effects of UV light. I don’t excessively protect against it, like Michael Jackson. However, I always carry the black higasa in the picture during the summer and avoid direct sunlight. There are other ways to protect against UV light besides a parasol: for example, sunscreen lotion, hats and long-sleeved clothes. But a higasa is superior to them because it serves the other purpose of giving cool shade. Yes. It’s tolerably cool under a parasol. 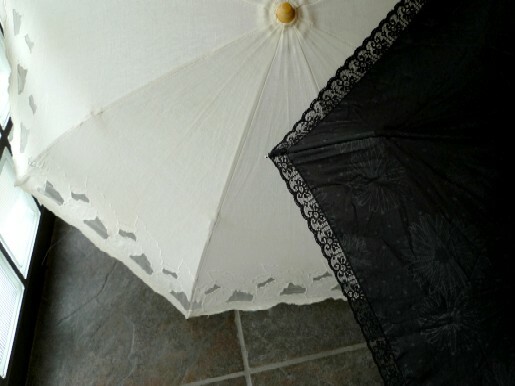 I use a parasol in many beach resorts and Western countries without hesitation. Let me point out one thing. I don’t care if your country doesn’t have a parasol culture, but don’t look at me weirdly if I put it up. So what? It’s just a parasol.